If you want to have access to an “endless source” of government forms, we do not recommend FreeGovernmentForms New Tab as a choice. We have discovered that this browser extension is quite unreliable and should not be trusted. In fact, this tool comes from a notorious family of useless toolbars and new tab tools developed by Mindspark Interactive Network, Inc. This company is also responsible for applications, such as MyMapsWizard Toolbar, CalendarSpark, Wallpaper by MyWay, and SmarterPassword Toolbar among many others. This new tab application is not different from its predecessors; it may pose a threat to your virtual security. Therefore, we have categorized it as a potentially unwanted program, or PUP. You should know that this PUP may display you potentially harmful search results. It is also important to understand that it is possible that you do not even remember installing this application. This means that it had to enter your computer in a stealthy or misleading way. We have no doubt that the best solution for you is to remove FreeGovernmentForms New Tab. But let us tell you in more details why we think so. Our research shows that if you do not recall downloading or installing this PUP, it is most likely that it came in a freeware bundle. In fact, bundling is probably the most common method for criminals to spread useless tools like FreeGovernmentForms New Tab and other threats, such as adware programs and browser hijackers together. PUPs as well as these malware infections can introduce you to unsafe web content and thus open doors for cyber criminals to scam you. So when you let such a bundle on board, you may greatly increase the vulnerability of your operating system. You may be surprised to learn that most malware infections and PUPs do not infiltrate computer systems in a mysterious way without the user’s knowledge; on the contrary, most of the time it is the user who actually initiates the download of such bundles. It is possible to do that when you visit a shady freeware or torrent site in an attempt to download a free application or movie. This might be the price for doing this through the wrong source: a package of malware infections. If you have landed on such sites lately, we advise you to delete FreeGovernmentForms New Tab and find out how many other useless applications may be endangering your computer’s security and integrity. You can try to manually find these but we suggest that you use a free online tool, a malware scanner, to do the job for you automatically and fast. It is also possible to find this PUP in the Chrome web store (chrome.google.com/webstore/detail/free-government-forms/pcckihfklbbjhlclpjbaomkhabnplejg) and as shown by statistics, over 47 thousand users have installed this tool that way. Yet, it is quite strange that if it is such a great extension why there is no review at all. To us it definitely does not sound too promising. But, if you care to run a quick Google check on this browser extension by using its special Chrome ID (pcckihfklbbjhlclpjbaomkhabnplejg), you may also find a couple of links to websites that speak about how and why you are supposed to delete FreeGovernmentForms New Tab. This should be more than enough for you to doubt the reliability of this tool. freegovernmentforms.net/search.htm, which could be manipulated by this PUP. As a matter of fact, it is possible that this tool collects information about you regarding your online activities in order to be able target you with third-party ads and links through its search results. The real issue here is that this information can get in the wrong hands, i.e., cyber criminals may access it and misuse it. So if you do not want to end up on malicious websites and become a victim of online fraud, you should really consider removing FreeGovernmentForms New Tab. It is really not that difficult to eliminate this threat once you make up your mind about it. 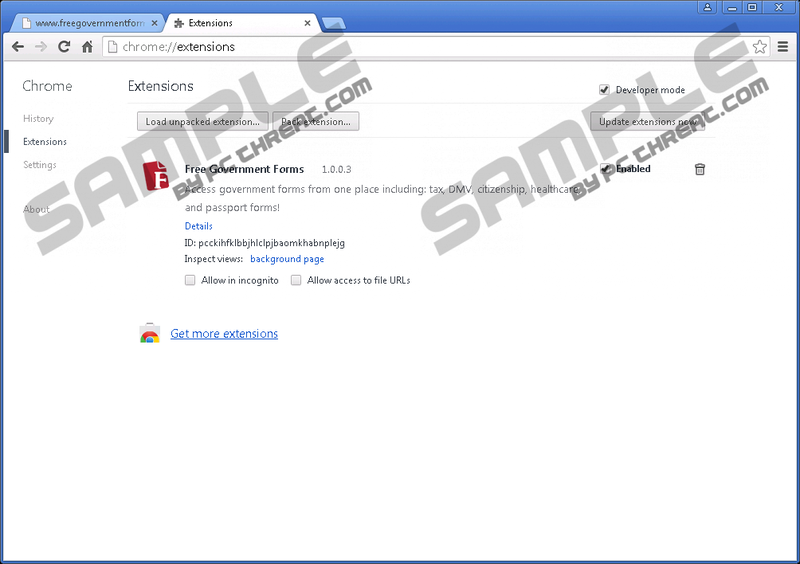 You can easily remove the Free Government Forms extension from Chrome. Please follow our guide below if you are unfamiliar with modifying browser settings. It is important that you protect your PC if you do not wish to encounter more serious threats. You can make sure yourself that you are more careful while online, but you can also install a professional malware removal tool to feel safe every time you switch on your PC or go browsing the web. Pick Extensions in the left panel. Select the extension and click on the trash can icon on the right. Quick & tested solution for FreeGovernmentForms New Tab removal.